For Immediate Release. Contact PR Consultant Kim Brukardt at 901-692-1203 or kimbrukardt@gmail.com. MEMPHIS, TENN. (July 2, 2018)…Killing weeds is a full-time job, but for local businessman Kenny Crenshaw, president of Herbi-Systems, Inc., it is equally important to preserve national treasures that hold a wealth of history. Crenshaw continues his annual journey to the nation’s capital in July to lead a U.S. grounds beautification project. 2018 marks 15 years of patriotic volunteerism and leadership for Crenshaw at Arlington National Cemetery and also the second of expanded labors to include an additional historic cemetery in D.C. His wife Melissa, Herbi-Systems employees Lee Tapley and Phil Davis, both industrial weed control technicians, will accompany him. In the ongoing project at Arlington, Crenshaw serves as a “champion” or leader during the National Association of Landscape Professionals (NALP)Renewal and Remembrance project. 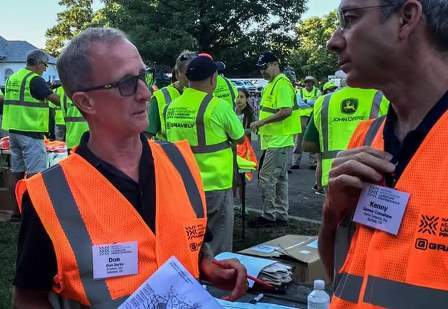 He jointly supervises 300 volunteers from across the country out of a total 400+ participants each July. 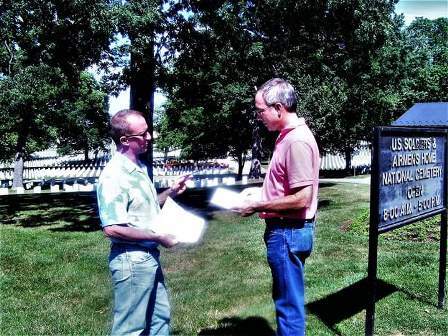 Crenshaw and Don Zerby, owner of Ecolawn near Cleveland, Ohio, schedule volunteer assignments and oversee lime and phosphorus applications, as well as aeration services, landscaping, tree cabling, and irrigation in key sections of more than 200 acres of the 600+ acre historic cemetery. Specifically, volunteers will apply lime to 87.5 acres; phosphorus to 45 acres; and aeration to 93 acres. “It is our desire to meet specific needs for Arlington each year that governmental budgets do not allow,” Crenshaw added. Crenshaw’s longstanding commitment at Arlington is in reverence to those who served their country as well as specifically to honor relatives buried there. He buried his Aunt Frances at Arlington in March of last year alongside his Uncle Ken Kruger, who served in the U.S. Navy as a naval carrier pilot. Arlington National Cemetery is the final resting place for more than 400,000 active duty service members, veterans and their families, including former Presidents William H. Taft and John F. Kennedy, according to the Cemetery’s Website, arlingtoncemetery.mil/about. And the 21-gun-salute is still practiced during heads-of-state visits and military funerals. Also from the pages of history, The Tomb of the Unknown Soldier can be found on the grounds, representing MIAs from WWI, WWII and the Korean War, as well as special areas such as the Nurses Section where departed souls going back to the Spanish-American War are buried. Last year, Crenshaw answered an administrative request to add another historic cemetery to his work schedule. Continuing that responsibility into 2018, he will supervise volunteer efforts to treat about 15 acres at the U.S. Soldiers’ and Airmen’s Home National Cemetery with lime as well as the provision of aeration services. Airmen's Home National Cemetery is located on land granted Soldiers' Asylum (1862). Commissioners of the U.S. Military Asylum offered six acres of land at the north end of the Home’s grounds for soldiers and officers just days after the Battle of Bull Run. The cemetery, located north of the capital, is one of two national cemeteries (the other is Arlington National Cemetery) maintained by the Department of the Army and is a final resting place for more than 14,000 veterans, including those from the Civil War - - both Confederate and Union -- including George Washington, Winfield Scott, and Ulysses S. Grant and 21 recipients of the Medal of Honor, according to nps.gov. (Ref: National Park Service, U.S. Dept. of the Interior.) Living in a cottage adjacent to the cemetery during summer and fall of 1862, President Abraham Lincoln viewed burials there -- the cost of war apparent. The burials piqued between August and December of 1862 when President Lincoln drafted and released the Emancipation Proclamation, (Ref: lincolncottage.org/new-soldiers-home-cemetery-website/). Also buried in the historic cemetery is Major General John A. Logan, who led the Army of the Tennessee and established the first Decoration Day observances which ultimately led to what is known today as Memorial Day. Here at home, Crenshaw also is involved with Big Creek Cemetery at 6839 Big Creek Church Rd in Millington, Tenn. The cemetery was first established in May of 1886 and sits on 6.55 acres, with about 650 graves going back to the mid-1800s including the Crenshaw family, as well as many other early settlers in the area. The cemetery was family owned in its earliest days. Crenshaw serves on the board of directors of Big Creek Cemetery Association. Big Creek Cemetery’s Homecoming event, where families gather to share memories, is set for Oct. 14. 2018 marks the 22nd anniversary of the Arlington Remembrance event which takes place July 16. For more information on NALP, visit landscapeprofessionals.org. To contact Herbi-Systems, call 901-382-5296 or visit www.herbi-systems.com.